The Prototype Avro Vulcan No.698 first flew on August 30 1952, . Now a famous example of British engineering heritage, the Vulcan was designed to carry Britain’s new nuclear deterrent, codenamed “Blue Danube”. Its vast size and large delta wing ensure it is perfectly distinctive today, let alone in 1952, when some thought they’d seen an alien spaceship. It was the first large delta wing aircraft (leading directly to Concorde), and featured innovations such as electrically-operated flying controls and an early version of ABS braking. Compared with its Avro Lancaster predecessor, which had first flown just 11 years before the Vulcan prototype climbed into the sky, its speed and agility were astonishing.The plane only entered combat once, and not in its nuclear capacity, when it flew 8,000 miles to Port Stanley Airport on the Falkland Islands in 1982, dropping bombs that prevented Argentina operating its own Mirage III fighters. Two years later the Vulcans were withdrawn from service, however one, XH558, still flew until 2015. This is owned by the Vulcan to the Sky Trust, which returned XH558 to the air in 2007.” AVro Vulcan XH558 (civil aircraft registration G-VLCN) The Spirit Of Great Britain was one of the 134 Avro Vulcan V bombers that were operated by the Royal Air Force from 1953 until 1984. Vulcan XH558 served with the RAF between 1960 and 1985 in the bomber, maritimereconnaissance and air-to-air refuelling roles. Between 2007 and 2015 Vulcan to the Sky displayed the Vulcan at numerous airshows, attracting millions of people (including me) annually. XH558, was originally the twelfth Vulcan B2 built, it first flew in 1960 and was delivered to No. 230 Operational Conversion Unit RAF at RAF Waddington on 1 July 1960. Almost immediately the aircraft moved with 230 OCU to RAF Finningley where the aircraft spent some eight years before returning to Lincolnshire in 1968. Most of its operational service was with the units of the Waddington Wing including No. 50 Squadron RAF. The aircraft was converted to a SR2 Maritime Radar Reconnaissance in 1973 and flew with 27 Sqn, subsequently to the air-to-air refuelling variant K2 in 1982. 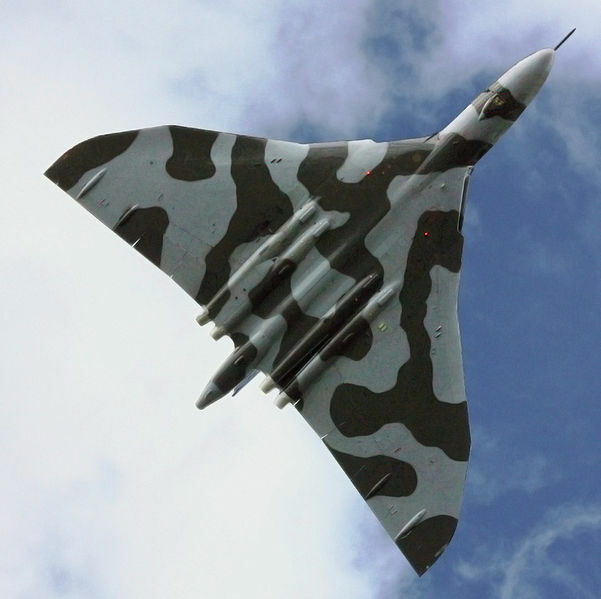 It was returned to standard B2 configuration in 1985 and was the last Vulcan in service. From 1986 to 1992, it was the RAF’s display aircraft.After service with the Royal Air Force, the aircraft was sold to C.Walton Limited and delivered by air to Bruntingthorpe Aerodrome on 23 March 1993. The aircraft was kept in a serviceable condition and would undertake fast taxi runs along Bruntingthorpe’s main runway. The RAF operated XH558 as a display aircraft from 1986 until 1992, when budget cuts forced its retirement. Vulcan to the Sky Trust currently maintain it as a display aircraft, funded entirely by charitable donations and the UK Lottery’s Heritage Fund.It is registered with the United Kingdom Civil Aviation Authority as G-VLCN but has an exemption to fly in Royal Air Force markings as XH558 and has been flying regularly at various air shows like Duxford, Waddington, Fairford and Cosford. The Avro Vulcan is an iconic example of British aerospace engineering at its world-beating best. Its impressive list of technical achievements includes being the first successful large delta wing aircraft, leading directly to Concorde and the Space Shuttle, and delivering performance and agility so close to a jet fighter’s that it was given a fighter-style control column in place of the traditional bomber pilot’s yoke. This agility allowed XH558 to deliver amazing air displays. She is an iconic example of that remarkable period of intense post-war innovation during the terrifying global tension of the Cold War.